Minister Uri Ariel slams Arab MKs for 'fanning the flames' after police officer killed in terror attack during demolition of illegal home. 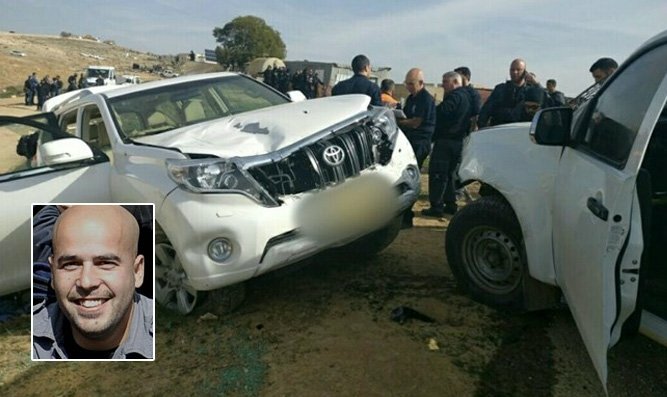 Agriculture Minister Uri Ariel (Jewish Home) responded Wednesday morning to the deadly terror attack in Umm Al-Hiran which left police officer Erez Levy dead and a second officer wounded. Ariel has been charged by the government with finding a solution to the problem of rampant illegal construction in the Bedouin sector and the existence of dozens of unauthorized settlements. The Minister slammed the involvement of Arab MKs from the Joint List party and other outside elements who encouraged residents of Umm Al-Hiran to turn down alternative sites to build. Ariel noted that the residents’ case had been heard and rejected by both a district court and the Supreme Court. “They’ve made these arguments in court, and even brought it to the district court and the Supreme Court,” said Ariel, adding that the appeals had been dismissed and the case closed. Ariel called upon local leaders in the Bedouin sector not to inflame tensions following the attack and subsequent demolition in Umm Al-Hiran.